Etymology of the name uncertain. 1. 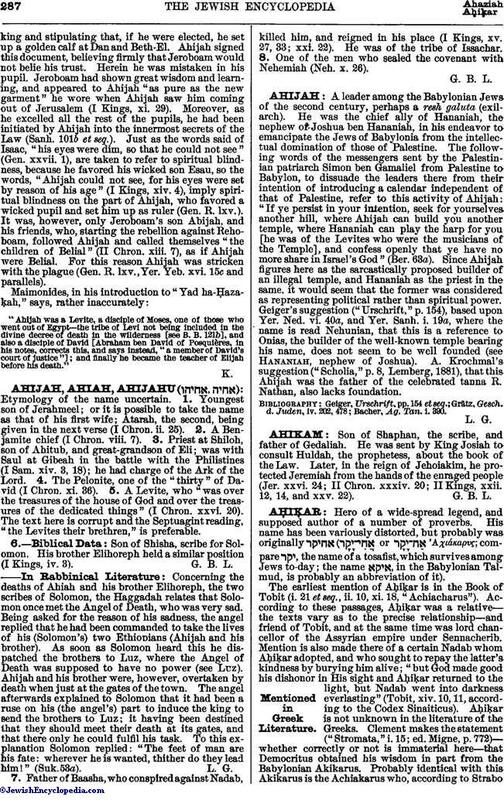 Youngest son of Jerahmeel; or it is possible to take the name as that of his first wife; Atarah, the second, being given in the next verse (I Chron. ii. 25). 2. A Benjamite chief (I Chron. viii. 7). 3. Priest at Shiloh, son of Ahitub, and great-grandson of Eli; was with Saul at Gibeah in the battle with the Philistines (I Sam. xiv. 3, 18); he had charge of the Ark of the Lord. 4. The Pelonite, one of the "thirty" of David (I Chron. xi. 36). 5. A Levite, who "was over the treasures of the house of God and over the treasures of the dedicated things" (I Chron. xxvi. 20). The text here is corrupt and the Septuagint reading, "the Levites their brethren," is preferable. Son of Shisha, scribe for Solomon. His brother Elihoreph held a similar position (I Kings, iv. 3). Concerning the deaths of Ahiah and his brother Elihoreph, the two scribes of Solomon, the Haggadah relates that Solomon once met the Angel of Death, who was very sad. Being asked for the reason of his sadness, the angel replied that he had been commanded to take the lives of his (Solomon's) two Ethiopians (Ahijah and his brother). As soon as Solomon heard this he dispatched the brothers to Luz, where the Angel of Death was supposed to have no power (see Luz). Ahijah and his brother were, however, overtaken by death when just at the gates of the town. The angel afterwards explained to Solomon that it had been a ruse on his (the angel's) part to induce the king to send the brothers to Luz; it having been destined that they should meet their death at its gates, and that there only he could fulfil his task. To this explanation Solomon replied: "The feet of man are his fate: wherever he is wanted, thither do they lead him!" (Suk. 53a). 7. Father of Baasha, who conspired against Nadab, killed him, and reigned in his place (I Kings, xv. 27, 33; xxi. 22). He was of the tribe of Issachar. 8. One of the men who sealed the covenant with Nehemiah (Neh. x. 26).